Yesterday evening was very clear. While looking up some deep-sky objects and while waiting for target satellites to appear, I saw several faint strays. Lacrosse 2 (91-017A) was 21.6s early and 0.16 degree off-track relative to a week old elset 08027.82795435. Hence, just like early January, it appears to have manoeuvred again. Update: Russell Eberst's data of the same pass confirm my observation. From a very preliminary analysis I did, it seems that the manoeuvre entails a similar mean motion change by about +0.0005 as was the case early last month. 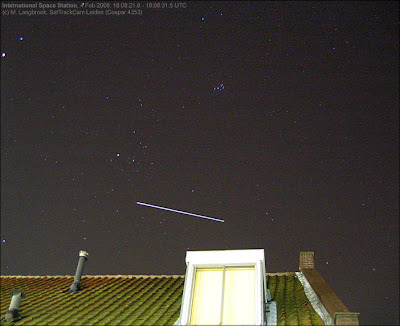 Other objects observed this evening were the ELINT sat USA 32 (88-078A) and the NOSS 3-2 duo (03-054A & C). In addition, I observed the International Space Station making a pass through Taurus just beneath the Hyades and Pleiades. I had not realised the decoupled Progress M-62 would be following it closely, so I missed that one (it also was just too far behind ISS to show up on the photograph I shot, see below). It was overcast this morning so again no chance to observe USA 193. It is still overcast, so I am going to miss both the old and new Progress (the latter launched today) tonight. I hope it clears in time to observe them and the Space Shuttle STS-122 that is scheduled to launch next Thursday.